Bizodisha Bureau, Bhubaneswar, April 16, 2019: The Centre is not facing any anti-incumbency this election and hit out at Congress saying it has lost credibility among the people as it has no mission and its leader (Rahul Gandhi) lacks vision, Prime Minister Narendra Modi said on Tuesday addressing an election rally here on Tuesday. “Now everybody knows that Congress has no mission, while its leader has no vision. They are devoid of principles and intentions,” Modi said without naming anyone. Mounting a scathing attack on the Congress, he said it can go to any extent for its vote bank. “The party and its friends have only one agenda – that of ‘Modi Hatao’,” he said. “I can see enthusiasm among the people here who are keen to elect a double engine government by voting for BJP both at the Centre and in Odisha to ensure speedy development,” he said. Prime Minister Narendra Modi also held a massive roadshow here to bolster BJP’s prospects in the Lok Sabha and simultaneous assembly elections in Odisha. Thousands of people, including enthusiastic BJP workers gathered on both sides of the streets, jostled for a glimpse of Modi and cheered the prime minister. Chants of “Modi, Modi” rent the air as his campaign vehicle moved through the city’s tree-lined streets during the 90-minute mega roadshow. The Prime Minister’s carcade incidentally passed through the intersection near the private residence of Chief Minister Naveen Patnaik, who was out of the city campaigning for his party – the Biju Janata Dal (BJD) in western Odisha. Prime Minister Narendra Modi held a massive roadshow here on Tuesday evening to bolster BJP’s prospects in the Lok Sabha and simultaneous assembly elections in Odisha. 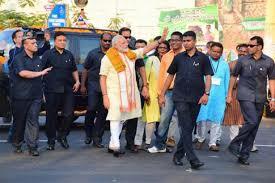 Modi kicked-off the over six-km-long journey in an open vehicle amid tight security from near the Biju Patnaik International Airport as dusk descended on the streets of Bhubaneswar, which was wrapped in saffron to match the occasion.